Science Fiction (Sci-Fi) is a genre that includes science technology that could possibly happen in the future and/or in space and/or in a different dimension. Check out these engaging science fiction chapter books for ages six to sixteen. I hope they’ll get your kids reading and reading and reading. This is one of our favorite graphic novels! Zita the Spacegirl is a true friend who not only saves her best friend from kidnapping aliens but saves the galaxy! Kudos to Dav Pilkey and Dan Santat for creating such an action-packed, engaging new series for young readers. And the illustrations are marvelous. It’s not often you see a book in full color – love that! 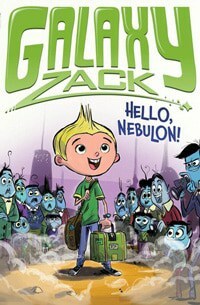 If your child likes these graphic novels, there are TONS of books in this funny sci-fi zombie series. Hilo can’t remember much before D.J. finds him crashed into the earth. But evil robots have followed Hilo to Earth and it’s up to Hilo to protect the earth. This ends of a cliff-note but is worth it — it’s a great page-turning adventure. I loved this fast-paced adventure series about a mad scientist who creates a hybrid crocodile-dinosaur-bird killer creature to stop visitors from entering the Everglades. Emmet and his father arrive to investigate but when his father is kidnapped, Emmet and his friend, Calvin, know it’s up to them to find where the kidnapper is holding Emmet’s father. GREAT for reluctant readers — and anyone who loves a crazy sci-fi who-done-it! Runt is a 12-year old with real problems. He doesn’t want to be a typical villager with the typical boring life. He wants to be a warrior like Steve. So he’s excited when his school finally agrees that the villagers might need warriors to fight back against the nightly attacks. When Steve loses everything and moves in with Runt’s family, Runt hopes that Steve will help with warrior training. But it’s a guy named Mike whose in the village jail that helps because Steve is too depressed. Runt’s a relatable, mostly serious, character who just wants a different life — like most kids his age and is competing for a dream opportunity. This series was AMAZING! It was a murder mystery on the moon. I can never turn down a good, realistic sci-fi PLUS murder mystery. It has it all! It was placed in 2040 and their second-in-command had died. He had walked out the airlock (to the moon’s surface) with his space suit on wrong– he died in seconds. Everyone thought he had gone crazy, but Dashiel suspected differently. Murder. The first book is almost mirrored in the second –the base commander this time disappears. With just enough breaking the rules, they can figure out where she is and who did it. ADDICTING!! In this story, the zombie apocalypse is kind of fun. At least that’s how Jack approaches life and zombie fights. He and his best friend, Quint, live in an upgraded, well-defended treehouse (which is SO COOL I totally want to live there) where they plan for rescuing his crush June (even though she doesn’t need rescuing being quite capable) and fighting zombies. Illustrations throughout make this even more appealing to read and imagine. I absolutely love this series. Mix the action-packed writing of Korman with a boy who can hypnotize others – and who is recruited to be in a “special” school to save the world. But is that really what the school does? And, unlike some series whos sequels disappoint, all the books in this series are excellent. Okay, this is more paranormal than sci-fi but SO good I wanted to include it in this genre list, too. Molly’s recruited to hunt zombies in New York City, just like her mother, who is dead. Or is mom actually a zombie? And why is she trying to contact Molly? This is a great action-adventure story with a mystery. I loved all the books in this zombie series. Now a complete series now that my kids and I highly recommend… Eli and his friends are riding bikes when they accidentally discover that some of them are physically prevented from leaving their utopia-type town. But there’s more. Then Eli discovers that his “father” is the leader of a group of scientists who are using the town and some of the kids, in a secret and unapproved science experiment. And you won’t believe what that experiment is!! (Hint: the title gives you a big clue.) Will the kids escape and will they be more than their DNA? Action & intrigue in outer space — this book will hook you right away. Christopher’s space colony home is attacked by pirates. He and many other children escape to the underground mines. Christopher’s determined to help the others find food, water, and the emergency beacon but first, they’ll have to work together and confronting a terrible truth about the Melming Mining company. The third and final book in the trilogy is out now. This is a not-to-miss middle-grade sci-fi series. Action and excitement from the first page! This is a crazy good story about a dangerous world where cloned dinosaurs have taken over the world. Now Sky and her fellow humans live below ground in safety with Noah as their supreme ruler. Sky discovers that her missing (maybe traitor?) father left her a secret note with cryptic instructions on how to be found. She decides to leave the underground city in order to find her dad. Barely outside a day, she and her friend Shawn are rescued from hungry dinosaurs by a boy who lives in a treetop enclave. When his enclave is attacked by Noah’s soldiers looking for her, Sky realizes that everything she believed about Noah is wrong and is even more determined to find her father. LOVE this trilogy! They’re not supposed to be in the woods, but to avoid Chad the bully Tamaya and Marshall go there anyway. Tamaya discovers the weird looking “fuzzy mud” and throws it at Chad’s face who had followed them. When Chad goes missing, and Tamaya’s hand gets a bloody rash, it’s clear that the mud is not just mud. Fast-paced and adventurous, kids won’t be able to put this book down. I couldn’t. Gorgeous artwork sets the tone for an otherworldly graphic novel story. The five worlds are falling into chaos. When one world attacks another, Oona Lee, a girl who is a sand dancer, rescues two boys and the three work together to light the unlit Beacons and save the worlds. But, they face a dark force that comes with a devastating betrayal. Not specifically sci-fi but an excellent dystopian middle-grade choice! The world is covered by a deadly “fog” that kills humans so the humans live only on the highest mountain peaks. Our heroes, a band of scavenging orphans, are trying to find something in the world below that they can sell in order to travel to another city where they can treat the cloud sickness of their beloved mother-figure. I loved the suspense, the fascinating world, the characters, and the happily ever after. Darkus Cuttle’s museum director dad mysteriously disappears from a locked room in the museum. Darkus learns that there’s something very strange going on . . . and it has to do with intelligent beetles and a cruel benefactress of the museum. This sci-fi chapter book took me by surprise; I can’t wait for the next book in the series. Action-packed science fiction with plenty of suspense, Ash wakes up in a medical facility on a remote island with gun-wielding soldiers and a dangerous poison that will kill his mother and the other trapped scientists within hours. He works with a girl named Isabel to traverse the island in search for the antidote carried by the soldiers. Of course, it won’t be easy. And there are more dangers than he knows. Delia interns at the Time Museum, a time travel museum where she and other kids her age compete for a permanent spot with the museum in this sci-fi graphic novel. A sinister time traveler forces the group to work together to stop permanent damage to the world and the time museum. My 11-year old thought this book was awesome. I couldn’t put these books down — which was a very fun surprise because I didn’t know what to expect from a Christian fiction series like this. The writing is fantastic — fast-paced and engaging and the story itself is intriguing, a futuristic world in which the four siblings archeologist parents are kidnapped by forces trying to find artifacts which will lead them to eternal life. The kids pursue both the artifacts and their missing parents across different planets where they discover a hidden civilization of blue-colored people, escape a dangerous laboratory with predatory creatures including dinosaurs, learn a friend is really a foe, get captured by pirates, and so much more. I’m looking forward to the final book, book five! This is a GREAT pirate adventure, only these pirates are in space and now supposed to be called the more politically correct term “privateers.” Tycho and his siblings are competing amongst each other for who will be the next captain after their mom. When it’s Tycho’s turn to captain, he encounters a ship with a suspicious diplomat. Unable to seize the ship’s cargo because of the diplomat, Tycho’s family demands a court decide. In this sci-fi world, brother and sister twins discover a big and dangerous secret. Their parents are robots, and so are all the adults in the world! Mesmerizing. I liked this book but it wasn’t the complete story so be warned, you’ll have to stay tuned until the next book is out to get more of the plot. Basically, this book sets things up — we learn that the random group of students in a bus accident all are different somehow — they each have powers. And so do their fire starting substitute teacher and their now invisible bus driver. The bus driver tells them he was transporting something secret and he thinks that affected all of them. Set in a dystopian society, this Newbery medal winner grabs your attention and keeps it until the end. What is going on in this community? When Jonas is assigned his job as “Receiver of Memory” he learns just how much his hidden and controlled. Now he’ll have to decide just what he’ll do with this horrifying information. I drug my heels about reading this book, I don’t usually like books with animal characters. However, from the first page, I couldn’t put it down. Holt is an amazing writer and the story is a fast-paced adventure that your kids will thoroughly enjoy. All the humans have either left suddenly or were rounded up and forced to leave. But not the dogs or other animals. Max, a yellow Lab knows that he must find and save his family. From the moment he escapes his kennel at the vet’s, he faces huge obstacles – angry, starving wolves, no food, a gang of subway rats, a house of cats, and the controlling Corporation, a “perfect” society for dogs where everyone works and no one can leave. Johnny is the anonymous reporter for the tell-the-truth secret school newspaper, The Woodford Word. His latest investigation is the unusual principal, an alien who is somehow brainwashing the whole school and the parents and turning them into chubby zombies. (The title is a BIG hint.) He pairs up with a girl named Julie, his friend Norris, and an unusual drama teacher to find a way to stop the alien principal from fattening up the students to eat them all. This sounds weird but it’s actually a great story of perseverance, friendship, and old-fashioned investigative journalism. Cleopatra is transported to the future on a different planet where she learns she’s destined to save the world. To prepare, she attends school (sort of) and trains with a wise old cat. She’s sent on her first mission before she is fully ready. Can she do it or will her lack of preparation ruin the mission? Wow – loved this adventure that is typical of Sanderson’s unique worlds with plot twists and turns.In this world, the Epics are super-powerful individuals with extraordinary powers and no goodness who control the cities. David’s father was killed by Chicago’s Epic, Steelheart, and David wants revenge. He joins the Reckoners to assassinate Steelheart, all the while studying the Epics to know their weaknesses. This is a page-turner and completely entertaining. Trout’s dad disappeared in The Bot Wars. When Trout makes a plea for his missing dad on a vid that goes viral, things go crazy FAST. Like the government trying to kidnap him. What do they know that he doesn’t know? A fast-paced, excellent adventure! I can’t believe it took me so long to read this YA book for it’s totally compelling and unique plot (with the craziest plot twist at the end!). How to explain . . . Imagine our world with more advanced technology that lets you “live” in a game world. Players hook up their bodies to the game, and while they’re in the game, food and bathroom breaks are taken care of. It’s crazy action and adventure that will keep you reading late into the night! I’m with the thousands (millions) of readers who rightfully love, love this YA book series that takes place on Mars in a color-coded caste society. Darrow, a low-caste Red, infiltrates the ruling Gold caste’s special training school. His training is to kill or be killed, lead an army or be enslaved. It’s better than The Hunger Games — especially for teens who don’t want to read about romance and who really get enthralled with battle strategy. Every book in this unique sci-fi series is addicting — I dare you to put it down. Cinder is a skilled mechanic cyborg, a human with machine parts, and lives with her step-mother and sisters. When Prince Kai asks her to fix something for him, she becomes entangled in a plot which puts her life at risk and the entire country’s fate is hanging in the balance. Teen, Pia, is the only immortal in the world. She’s been raised in seclusion (captivity?) in the Amazon jungle with no knowledge of the outside world. But, all that changes when Pia finds a hole in the electrified fence and meets a village boy who helps her see that her origin might be a secret the scientists will kill to guard. Or worse. Predictable yet still entertaining. Yes, another dystopian novel – but if you like them, here’s another entertaining read. Nix creates a world of evil Overlords who kill children on their 14th birthday to turn them into hybrid-machine-animal killers. Shade, a holograph projection of his original adult self, guides escaped children to discover the Overlord’s secrets. Only how many children have sacrificed their lives for his missions? Is he everything he says he is? Basically, this is a survival story that happens after an alien invasion. It’s good but I wasn’t hooked enough to read the rest of the series. However, the rest of the world thinks this is awesome . . . you decide for yourself.